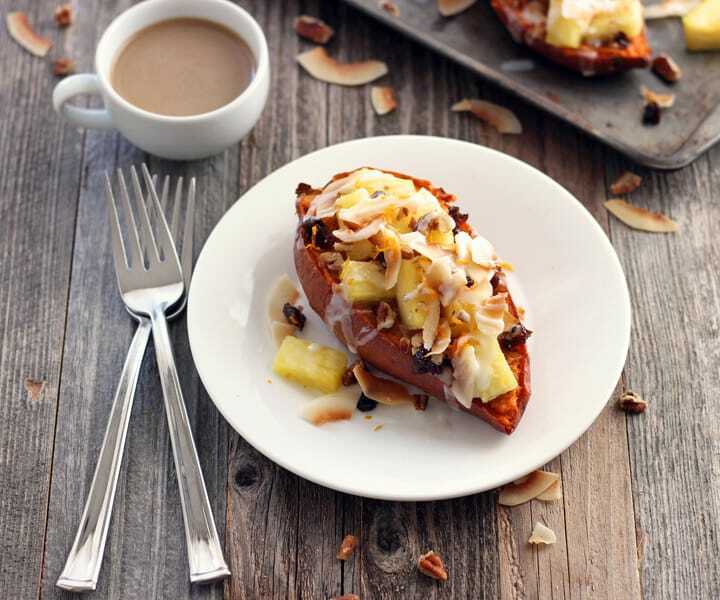 These sweet and creamy Vegan Twice-Baked Sweet Potatoes with Pineapple and Coconut are a fun and healthy spring breakfast, lunch or dinner for two. But these aren’t just any old sweet potatoes. 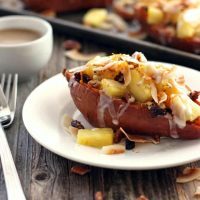 Nope, these garnet colored spuds are baked to perfection, crammed with flavor and then piled high with fresh pineapple and toasted coconut for a delicious and filling meal! Now I promise to simmer down with the shouting and exclamation points but dang I am just so excited. No joke, I’ve made these Vegan Twice-Baked Sweet Potatoes with Pineapple and Coconut 4 times in the last two weeks. Why Should We All Eat More Sweet Potatoes? For starters, they’re high in fiber, essential vitamins (A & C) and minerals that our bodies appreciate. Oh yeah, they’re sweet, creamy and super moist too. Sweet potatoes are so moist that you can mash their flesh into a smooth creamy texture without adding any dairy. We actually have their prepared foods section to thank for that useful bit of dairy-free sweet potato mashing knowledge. See, last summer Tim and I visited my veggie nacho lovin’ sister and she offered us a twice baked sweet potato she had picked up from there. It was so rich, smooth and flavorful I couldn’t believe my eyes when I read the ingredients on the container. No butter, no cream just sweet potato and spices. You start with a batch of coconut oil rubbed toaster oven baked sweet potatoes. Scoop out the flesh and mash with cinnamon, ginger, orange zest, pecans and raisins. When it comes to mashing I’m a little lazy and just use a fork but if you want things ultra-creamy bust out your hand mixer. Then, stuff the potato shells with the deliciously creamy (with a hint of carrot cake flavor) mash and warm in your toaster oven. Next, top those tasty sweet taters with juicy fresh or canned pineapple chunks, unsweetened toasted coconut and more pecans and raisins. Finish with a generous drizzle of coconut butter* (the most under-rated way to enjoy coconut IMHO). 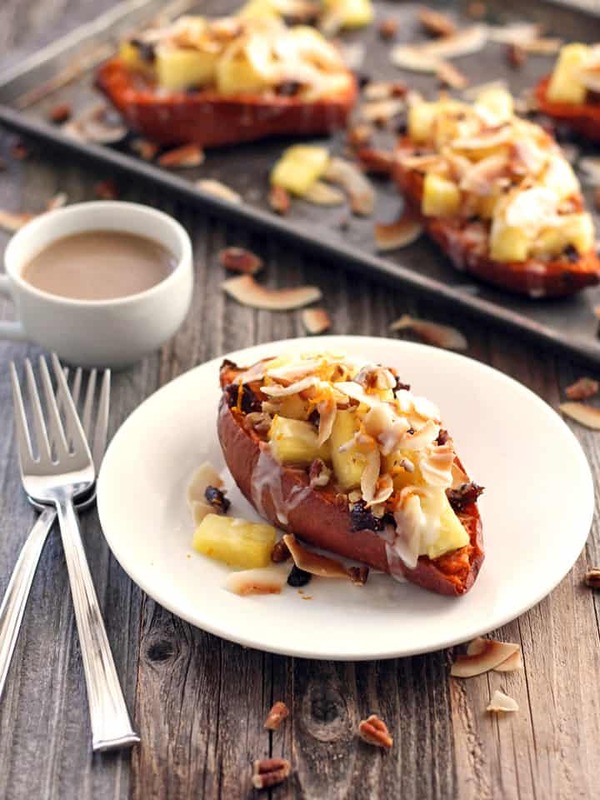 Now immediately locate the nearest fork and dig into these super filling over the top fun Vegan Twice-Baked Sweet Potatoes with Pineapple and Coconut! *You can find Coconut Butter, also called Coconut Manna at most “health food” stores or order it from Amazon. Our favorite is the Nutiva brand coconut butter, a little goes a long way so the two-pack will last you quite a while. You can also try making coconut butter at home using dried unsweetened coconut. We have never made our own – it seems a little hit and miss depending on the appliance used. But Chocolate Covered Katie has a great post with lots of Coconut Butter info including her homemade recipe and 65 other recipes to help you use up those jars of coconut butter! Sweet potatoes baked to perfection, mashed with spices into a creamy dairy-free filling and topped with fresh juicy pineapple and toasted coconut. Stab sweet potatoes with a sharp knife or fork a few times on their sides. Rub each sweet potato with coconut oil. Arrange sweet potatoes on a prepared cookie sheet or baking rack and place in a cold toaster oven. Turn the oven to 400 F and bake for about 45 minutes or until a knife slides easily into the side of each sweet potato. Remove cooked sweet potatoes but leave your toaster oven on reducing the temperature to 350 F.
Allow sweet potatoes to cool for 10-15 minutes. Carefully slice each cooled potato in half lengthwise. Use a spoon to scrape the insides into a small bowl. Leave at least a 1/4 inch layer intact and be careful not to tear the sweet potatoes. Place the empty sweet potato shells onto a cookie sheet. Mash the sweet potatoes until almost smooth. Stir in the cinnamon, salt, ginger and orange peel. Mix well to combine. Stir in half of the chopped pecans and half of the raisins. Spoon the filling into the empty shells. Return filled sweet potato shells to the oven and bake for 10 minutes until warmed. 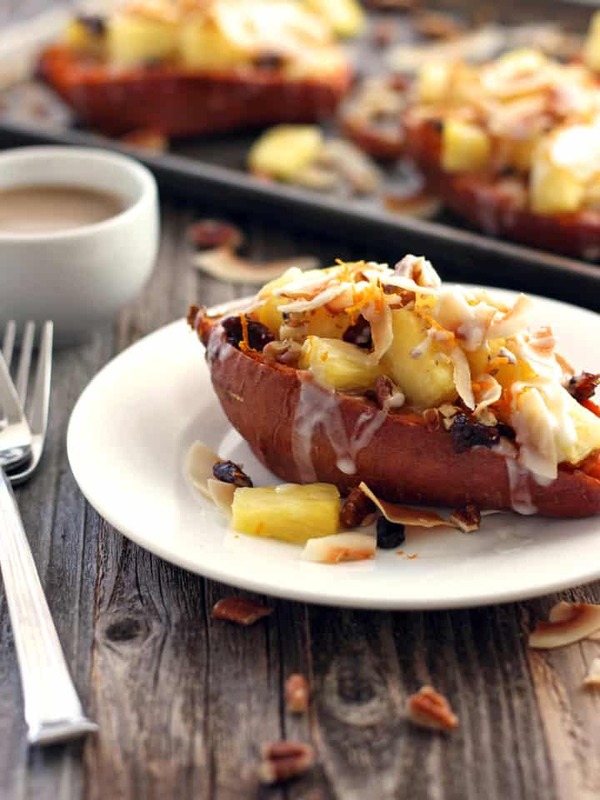 Top potatoes with pineapple, toasted coconut, pecans and raisins. Drizzle with coconut butter and serve warm. To increase the protein in the meal and make the filling even creamier you can stir in 2-3 tablespoons of non-dairy yogurt, coconut cream or coconut milk when mashing the sweet potatoes. Recipe makes 4 sweet potato halves, Nutritional Information is an estimate for a single serving of 2 sweet potato halves. Wow! This is something I’ve never seen before, they sound like dessert. Delicious! fantastic flavors! i certainly have never had a twice-baked potato quite like this, and now that i think about it, i don’t think i’ve had a twice-baked sweet potato at all! great idea! 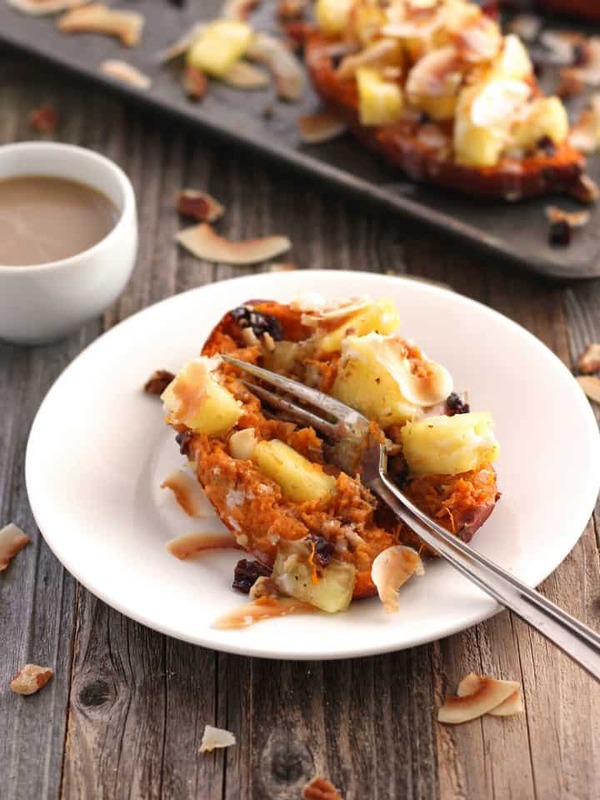 Sweet potatoes stuffed with pineapple and coconut? Yes please, sounds so delicious!